The newly announced Microsoft Lumia 540 adds to the latest generation of Lumia devices which currently holds Lumia 640 and it's bigger sibling, the Lumia 640XL. As the name suggests, Lumia 540 Dual SIM is yet another affordable Lumia with impressive features. The looks of it has been inspired by the long gone Asha series and the other Lumia's. It's instantly identifiable as a Lumia all the way. It comes with a big enough 5" screen with 720p resolution which converts into 294 ppi. Again it has a 1.2 GHz quad core snapdragon 200 processor and 1GB RAM with 8GB internal storage. It runs the latest version of Windows phone with Lumia denim. What has improved is the camera, the rear holds a better 8MP shooter with LED flash coupled with 5MP wide angle camera in the front. Also the battery is now bigger to support the resolution, it has a powerful 2200mAH battery. The only thing missing from the Lumia 540 is the Gorilla glass 3, which is present in the Lumia 535.So you'll have to purchase a screen guard with it to keep away scratches. Available at $149 with orange,green,black and white colours, the Lumia 540 is a steal deal. The Lumia devices provides a lot of options for consumers to choose from, which is good for Microsoft. Note : This post was typed from my new Lumia 535 using Pin Blogger app. If you are living in India or any country where cricket is one popular sport that millions cheer along. You may not like miss the happenings but sometimes you'd have work or anything else that would not let you view the match directly. 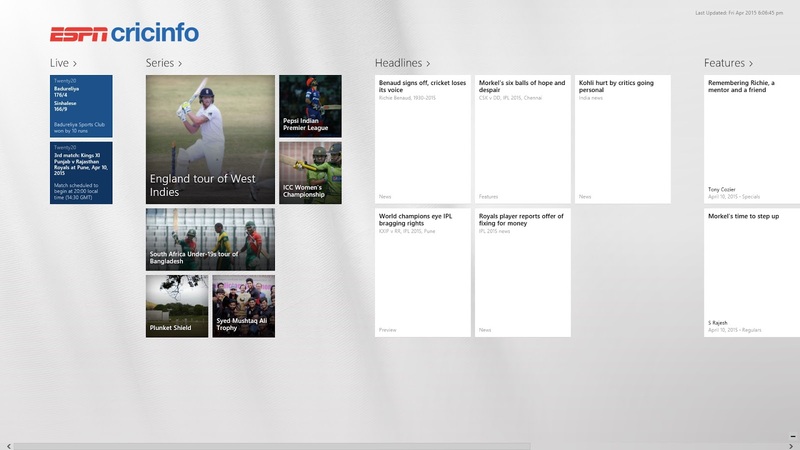 Apps in Windows 8.1 will keep you updated with your favorite sport. Here is one app which will help you to follow your cricket team. As the name suggests, it is developed ESPN and is the app version of it's Cricinfo website. The app is complete and full featured. As you open the app, it presents Live matches, on-going series, Headlines, Features and News in a simple UI. You click/tap any one of those topics which shows the fixtures and news about the series. It's far simple than always opening your browser and navigating to the sites especially if you are using your Windows tablet. 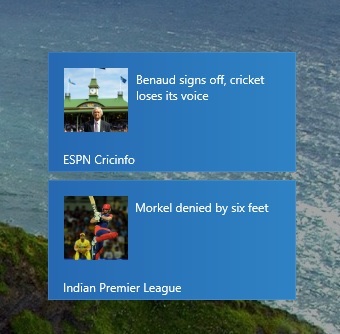 You can also pin any of your favorite series and the Live tile would show news and current score's of matches, which is really good as you don't even have to open the app. It is fast, simple and easy to use. Download it from the Store by following this link.